PCA is a ministry inspected school. 95% of PCA students successfully passed the Ontario Grade 10 Literacy Test compared to the Provincial average of 82%. 98% of our graduating class attended university, 1% attended college and 1% pursued other opportunities. PCA graduates have accrued 64,830 hours of Community Service. That is equivalent to over 7 years of continuous service. The average number of Community Service hours by graduate was 144 hours. That is almost 4 times the number required by the Ministry of Education. 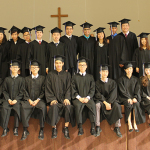 Over 84% of the graduates who began at PCA from JK through Grade 5 (8-14yrs @ PCA) were Ontario Scholars.